Stellar Four: Steampunk Starter Kit Contest! 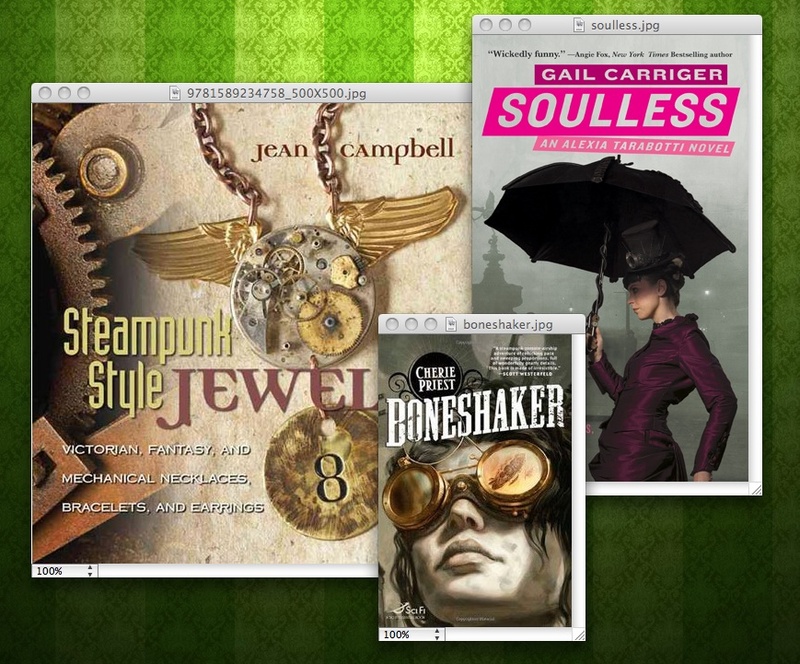 We're finishing off Steampunk Week this Sunday with a bang: our first ever contest! 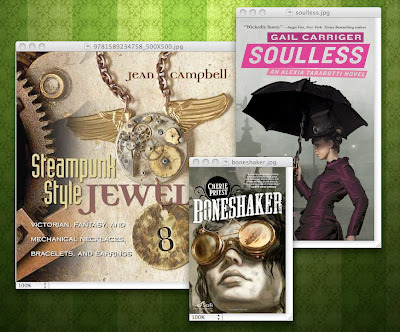 We're giving away a Steampunk Starter Kit including Cherie Priest's Boneshaker, Gail Carriger's Soulless and Jean Campbell's how-to, Steampunk Style Jewelry. Interested? All you have to do is show some love for Stellar Four! Follow us on Twitter, like us on Facebook, or follow us using Google Friend Connect. Already a fan on Twitter, Facebook, or Google Friend Connect? Don't worry, you've already been entered into the contest! Check back Sunday evening (5PM Pacific Daylight Savings Time) when we announce the winner. UPDATE! Please note, we can only ship within the United States. Though, this post and your interview reminded me that I hadn't checked my library for Soulless recently (when I first read about Carriger they did not carry her stuff). Now I've got the book on hold. Hooray! That's right, C. We don't like your kind here. We especially don't like the idea of coming up to visit your kind so we can sneak on to the sets of Supernatural and Fringe, gawk at all the cute actors and then make you take us to loads of fun nighttime social activities. Yay! I'm glad you're picking up the book! Hey, did you ever read Neal Stephenson's Diamond Age? I think you might like it. I really did. It's not steampunk as much as futuristic neo-Victorian but it's a good quick read. I have not, will add it to my ever growing list. Did I tell you I came close to greatness the other day? Walked by a Fringe set! No Pacey, sadly, or any actors. Just random tanks in and debris in the heart of downtown. C, YOU HAVE TO GET PHOTOS FOR US NEXT TIME! Use your cell. It'll be a Fringe exclusive. Uh, I still have a photo my roommate gave to me my junior year in college when she was an extra on Dawson's of she and Pacey. Well, it's just him, really. I sliced her out upon her insistence. It's buried away but it's still there. Basically it was just a bunch of burnt up cars and a tank in a generic downtown street. I don't have pictures with or of anyone famous! I did get to try on an Olympic silver medal last year, that was kind of cool. Awww, I'd like you even if you didn't offer to give me stuff. Curious: WHAT?! You need a new phone. The iPhone 3GS is on sale now for $50 since they need to make room for whatever's coming out this summer. They're a solid little phone. Nara: I googled around and couldn't find any steampunk socks to send you. Someone needs to get on that STAT. Weave little gear patterns in to it. WHAT! How could steampunk socks not exist! Soon I will take comfort in my easter bunny socks.